2014 is nearing its end, but we're pretty sure you're well aware of that. What you might have missed, however, is that over the last couple of weeks, we've been highlighting the year's notable events, the most remarkable products, and the most impressive innovations that occurred throughout the mobile industry. You know, events like the acquisition of Nokia's Devices & Services division by Microsoft, devices like the outstanding Samsung Galaxy Note 4 or iPhone 6, and innovations like rapid battery charging for smartphone batteries. It is something we feel obliged to do as the year is coming to an end, just to give ourselves and our readers a clearer picture as to how much and in what direction the mobile arena has shifted over the past 12 months. Would you like to join us on our year-in-review journey? 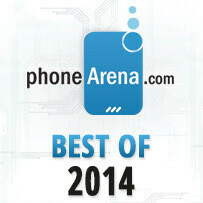 Then we bring to your attention the PhoneArena Awards of 2014. Feel free to scroll through the collection of links below and check the winners in each category you're excited about. These are the mobile products that defined 2014 – the best smartphones and tablets that we had the chance to review this year. And to spice things up a bit, we added a category for wearable devices – for the increasingly popular smartwatches, in particular – to this year's awards. As usual, we've also honored the best smartphone cameras and the smartphones with best bang for their buck. And here are our awards honoring not devices in particular, but their notable designs and outstanding features. Below you'll also find our selections of best apps and games for 2014. Last but not least, we're mentioning the biggest disappointments we witnessed over the past 12 months. Dec 15, 2014, 1:34 PM, by Victor H.
Dec 12, 2014, 5:55 AM, by Victor H.
if premiums means mediocre quality image and low mp camera, then yes, hands down to the oneplus. I think Xiaomi Mi4 is the best smartphone of the year for the price (325 USD). battery life is 3 hours shorter (8 hours playtime) than oneplus (11 hrs play time), but pretty much everything else is equal or better. Yes! Wonderful design. Camera is the worst. Congrats to Apple, winning best smart phone for that dazzling iPhone 6. Beautiful, powerful, thin, sleek, and that wonderful eco system. Well said bro, Apple quitely handled the minute issue, and all is well. Great phones. Loving my gold 128 gig 6 plus. The regular 6 bends, too. The 6+ is just more prone to bending. I can show you at least 500 phones that at the very least wnt bend in your pocket or bag and also shouldnt. The fact you are will to accept the fact that a phone costing $1000 does bend in your pocket just shows how shallow you are. I dont care if you like whatever phone you like its your money. I like iPhones too. But at what point do you say, Apple was wrong to release a POS to the market knowing full wellits design is subpar. How is it HTC and others who have made 100% metal phones manage to make them far less fragile and they dont cost $1000, yet the iPhone does cost nearly $1000 and its more fragile than phones that factually are better designed? Its not the point of whether a phone can or can't bend, the point is should it when it cost more than all others and the answer should be NO. I can show you 500 smartphones released since he very first and they won;t bend in your pocket and at least 1/4 of them can't be bent with bare hands too. I believe you mean "best" selling device. Largest selling device would be more along the lines of a TV. And Apple Pay is not innovation. NFC payments have existed for several years now. Best Smartphone, Galaxy Note 4 Best Phablet, Galaxy Note 4 (There is more to a phablet than size) Largest selling device - Why does this even matter? Macdon;ads sell more hamburgers, would you say itsthe best hamburger? Best Tablet, Surface pro 3 Best Hybrid - Tesla Best Games, Vain Glory, Monument Valley and Seabeard Best Apps, Pixelmator and Ms Office suite Best Inovation, Apple Pay and Metal api for graphics. APPLE PAY? SUCH A LAUGH. Best OS, ANDROID with 80% marketshare, Windows with 90% marketshare. The best phone and phablet is the note 4 easy. Best Smartphone in the world (only 2) - Note4 - Note Edge others are just runner ups. Things have to be said bro. Written like a true mentally disabled person, well played sir. Overpriced phones sammy? Should've been apple's iphone.